Venerable Bhikshu Ben Yin is Vice-President of Nanputuo Buddhist Institute in Taichung Taiwan. The Buddha’s purpose of establishing precepts is to regulate the monastic sangha so that the three poisons—ignorance, attachment, and anger—will be uprooted and the Dharma will be forever sustained in the world. After the Buddha’s parinirvana, the Buddhist community split into various sects. Buddhism was transmitted into China, and the first bhikshu appears in the Cao-Wei Dynasty during the Jia Ping years of 249-253 AD. Bhikshu Dharmakala translated the Pratimoksa of Sāṅghikā-vinaya .1 Meanwhile, during the era of Zheng Yuan, 254-255 AD, Bhikshu Tandi, from Parthia (today’s Iran), came to the Baima Temple in Luoyang where he translated the ordination sanghakarma of the Dharmaguptaka school. Furthermore, (bhikshu) ordinations starting with Zhu Shi-xing and others began. The bhikshu ordination continues till today in the Chinese community. After 250 AD, during the Dynasty of the Three Kingdoms, various schools of Vinaya came to China at about the same time. The translation of the texts of the four major Vinaya schools3 along with the five Vinaya commentaries were completed. At first, the Sarvastivada Vinaya and Mahasanghika Vinaya were practiced and circulated, but only one school succeeded in becoming a living lineage over time; that was the Dharmaguptaka School, which was promoted by Vinaya Master Daoxuan4 and became known as the Nanshan Vinaya School.5 From that time onwards until today, without interruption, the Dharmaguptaka ordination procedure has been used and the Dharmaguptaka Vinaya has been followed. Vinaya Master Daoxuan used the Dharmaguptaka Vinaya as the base, checking it against all other schools. He cited references extensively, combined the Mahayana motivation with the practice of keeping Pratimoksa precepts, and developed a structured approach to Vinaya study which involves examination of the four aspects of the precepts: 1) the precepts of the Dharma, 2) the precept body, 3) precepts-in-action, and 4) the characteristics of precepts. 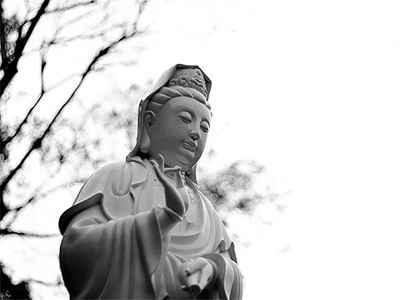 Being an authoritative guide to the Chinese lineage, he made a tremendous contribution to the Vinaya School in China. Vinaya Master Daoxuan agrees with Ven. Gunavarman (Xu Tsang Jing v41,p284b), and he further confirms, “The single sangha ordination with only the bhikshu sangha is still valid,” because there is no statement in the Vinaya that clearly says the ordination is invalid if the candidates are ordained only by a single sangha without being first certified by the bhikshuni sangha. If there were such a statement in the Vinaya that invalidates ordination by a single sangha, then since the practice of dual sangha has not been continuous, the lineage of bhikshuni ordination in China would have been discontinued. There would be no one in China who could give the bhikshuni ordination, and we would have to again invite foreign bhikshunis for assistance. Vinaya Master Daoxuan said that it is acceptable to adopt an explanation from another Vinaya school if nothing on that particular topic can be found in our school. Let us apply this to the issue of bhikshuni ordination. In the Sarvastivada Vinaya, volume 55 , ( Taisho v23, p405a), it says, “Ten bhikshus live in a remote area but only five bhikshus are present in the ordination. Does the candidate receive the precepts? Yes, he receives the precepts but the ordaining sangha commits a transgression.” In the Mulasarvastivada Vinaya, volume 13 , ( Taisho v24, p597c), it says, “In a remote area where it is possible to find ten monks, only five are present at an ordination. The candidates are fully ordained, but the sangha commits a transgression.” According to the bhikshu rules, ten bhikshus are needed to perform an ordination karma. If this rule—having sufficient number of participants—is violated, judging from the Sarvastivada Vinaya and the Mulasarvastivada Vinaya , the conclusion is that the candidates still receive the precepts, but the preceptor commits a transgression. Similarly, when the rule—dual sangha bhikshuni ordination—is violated, although it is against the Buddha’s instruction, its result should be similar to the case of insufficient monks in a bhikshu ordination. That is, the bhikshuni candidates receive the precepts, but the ordaining sangha commits a transgression. This proves that the inferences made by Gunavarman and Vinaya Master Daoxuan are without fault. The dual sangha ordination lineage in China began in the 11th year of the Yong Jia era, 434 AD, in the Liu-Song Dynasty. However, in the fifth year of the Kai Bao era, 972 AD, it was stopped by Emperor Taizu of the Northern Song Dynasty. The ban was lifted in the Southern Song Dynasty during the era of Xian Chun, 1265-1274 AD ( Taisho v49, p396b). Thus the ban was in effect for about three hundred years. However, other historical materials from that time record that bhikshus openly recruited nuns to receive the dual sangha ordination ( The Four Books, Zih Bu Za Jia Lei p.31 ). Nevertheless, because China is a huge country, it is hard to say whether a record exists somewhere that proves the uninterrupted existence of the dual sangha ordination. In the Ming Dynasty, Qing Dynasty and even the modern era, ordination with a single sangha was commonly seen. To avoid being labeled as someone who just looks like a bhikshuni, many nuns seek ordination by a dual sangha. In short, while the history of the dual sangha ordination has occasionally been interrupted, bhikshuni ordination in Chinese Buddhism has continued to this day. Clearly, the ordination was given based on the reason that candidates receive the precepts in a single sangha ordination. Questions have been asked to Chinese Buddhist monastics about Vinaya issues regarding bhikshuni ordination. When focus is put on the ordination procedure, since each Vinaya school has its own view on what is important and what is not, what can be adopted and what cannot, how can we determine whether one particular procedure is legal or not? Also, for the purpose of practice, what can we do in terms of adopting ideas from other schools? Vinaya Master Daoxuan has set a guideline: When a particular Vinaya school is used for the ordination procedure, we should rely on this Vinaya school in determining the issue of the ordination’s legality. However, if the texts of this particular school are not clear on particular points, for the purpose of practice we should adopt explanations from other schools ( Taisho v 40, p2-3). The fundamental logic for the guidelines for following explanations found in other Vinaya Schools is as follows. After the Buddhist community split into various sects, each sect has its own set of priorities and each of them provides guidance on how to practice, which, in turn, leads to the final liberation. It is like a big map torn into pieces: the followers of each sect possess one portion which describes the direction toward the destination. Some of the routes are shared by all sects, some are not. When we come to a point and encounter a certain situation, some portions of the map describe the situation while others do not. Since one portion of the map does not include all the details, if we only consult it the problem cannot be solved. To determine which direction to take, we have to consult other portions of the map. As stated in Mahisasaka Vinaya , “Although something is regulated by my school, if all other schools deem it impure, it should not be adopted. If something is not regulated by my school and all other schools say it is to be practiced, I must also adopt it.” Based upon this thinking, the guidelines for consulting other Vinaya schools can be determined. There are two main points in doing this. 2. To set up a standard that remains consistent within a school: (1) Regarding determining what to observe and what constitutes a transgression, generally speaking, if the sanghakarma of a certain school is used for ordination, the Vinaya of that school should also be used to determine the different degrees of observation or transgression of the precepts. That is, one’s actions and practices should correspond with the precept body that one has received. For instance, when performing ordination, the Chinese Buddhist community uses the sanghakarma of the Dharmaguptaka Vinaya. So the Dharmaguptaka Vinaya should be the primary reference for learning the characteristics of each precept and putting them into action. To determine whether a transgression has been made within our own school, we should not use the Vinaya of other schools. By the same token, we should not use the Vinaya of our own school to criticize other schools or to say their procedures are illegal because each school has its own detailed explanations. (2) However, there are some exceptions. If (a) one’s own Vinaya is not clear or (b) an incident happens, but no clear explanation related to it can be found within one’s own school, it is permissible to use the Vinaya of other schools to make a decision; we can borrow ideas from other schools to supplement one’s own. Nevertheless, since the way to conduct a sanghakarma is already prescribed in one’s own school, we should follow that instead of other schools. According to Vinaya Master Daoxuan, asking monastics from other Vinaya schools to assist in an ordination or following Vinaya explanations of other schools should be done only if they cannot be found in one’s own school. If a group of monastics agree to invite monastics from another school or use the explanations of another school to supplement their own, they should not later criticize the other school or regard it as not being in line with the rules. The Vinaya commentary Xing Shi Chao 8 ( Taisho v40, p155b) gives two examples: according to the Sarvastivada Vinaya and Shan Jian 9 if there is no preceptor (Upadhyaya) for a bhikshu ordination, the candidate still receives ordination, but the sangha commits a transgression. The Commentary of Mo De Le Qie says that if a layperson is the preceptor, the candidate still receives the ordination, but the sangha commits a transgression. Although other schools say the ordination is still valid, according to the Dharmaguptaka Vinaya, if there is no preceptor present10 or if there are two or three preceptors, the ordination is not valid. Also, in the Mahasanghika Vinaya and the Sarvastivada Vinaya , the steps of a sanghakarma can be increased. For example, if the original procedure involves only an announcement, it can be increased to one announcement followed by one proclamation, or one announcement followed by three proclamations. However, the steps cannot be decreased. According to the Dharmaguptaka Vinaya , sanghakarma procedures were established by the Buddha, so any decrease or increase to the procedure would make the ordination invalid. Judging from the above analysis, when foreign monastics come to transmit the ordination, their purpose is primarily to fulfill the function required by the Vinaya. The local Vinaya school should not invalidate the ordination based upon different views or standards held by the other school. For example, Theravada bhikshus or Tibetan bhikshus could go to a Chinese temple and join the bhikshu sangha there in giving ordination without any problem. If they reside with the local sangha, they should follow the Vinaya standard of behavior of the local Vinaya school. If they reside on their own, this is not necessary. There is just one outcome from of a legal full ordination—the person is fully ordained. However, when putting the precepts into practice, different Vinaya schools may have different ways to describe the precept body or the characteristics of each precept. It is like there is simply one flow of water of Dharma, but it enters into various rivers and streams. According to the channels, different labels come to exist. Even though a monk is first ordained with the sanghakarma prescribed by the Dharmaguptaka Vinaya , there is no problem for him to be a well-behaved bhikshu if he happens to like the Sarvastivada Vinaya and puts it into practice.11 As long as he observes the precepts carefully, following the standard set by that school, he will receive the benefit of taming his defilements. Doing this does not contradict the Buddha’s purpose of establishing the precepts. However, if a person picks ideas randomly from different schools and practices without any specific standard, then he is going against the Buddha’s purpose of establishing the precepts. This individual does not belong to any of the schools, and his actions should be seen as improper and illegal. Vinaya Master Daoxuan is strongly against such type of practice. Therefore, Vinaya Master Daoxuan set up guidelines regarding when to follow the explanations of other schools so that the lineage of one’s school as well as its sanghakarma are in accord with that school’s fundamental belief and the observation and transgression of the precepts can be clearly distinguished according to one’s school. These guidelines enable practitioners to receive the precept body according to the Vinaya school whose ordination procedure is used and to act in accord with the precepts so that all their actions reveal the characteristics of the precepts. They also ensure that members of one school will not criticize other schools or argue about who is right and who is wrong. In this way, all the various Vinaya schools can be harmonious, and the Dharma will not decline in the world. Together we will spread the holy Dharma. This will be praised by all. This paper has briefly introduced the history of the Chinese Buddhist tradition and discussed the guidelines set by Vinaya Master Daoxuan when adopting explanations or inviting monastics for a sanghakarma from other Vinaya schools. I hope that with these guidelines in mind, we will know what to adopt and what to abandon without causing disputes among Vinaya schools. Since my fellow brothers and sisters in the Tibetan Buddhist community are considering establishing a bhikshuni lineage, it is my hope that the points raised in this paper are helpful. Since the study was done within a limited time, I fear that errors might have been made. Please extend your kindness and point them out to me. Thank you.